It’s back! Real Life Wedding so you can have a snoop into someone else’s wedding day! This feature is so sought after and for any of the couples featured it’s a fabulous momento of their special day to look back on. 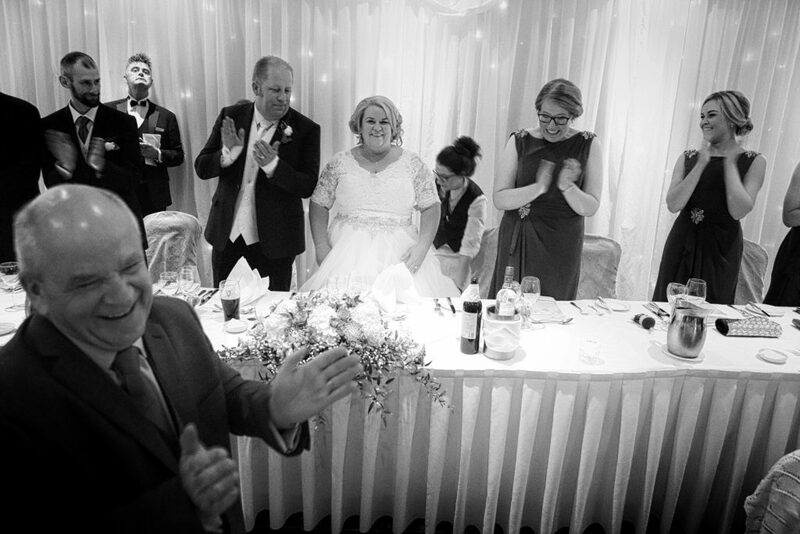 Have a read of Francis & Elaine’s special day. Band: The Bentley Boys – apart from the amazing first dance, the band played Father and Daughter by Paul Simon and all the dads and daughters danced with me and my dad. It was one of my favourite moments of the day! Band: The Bentley Boys – we gave the band a list of songs that we liked and they played every single one of them either during the main set or during the DJ set. They were brilliant and the floor was constantly full of people having the best of fun. Length of engagement: We got engaged on Christmas Eve 2016, so just over 9 months. Francis and I did it together which made it a walk in the park. 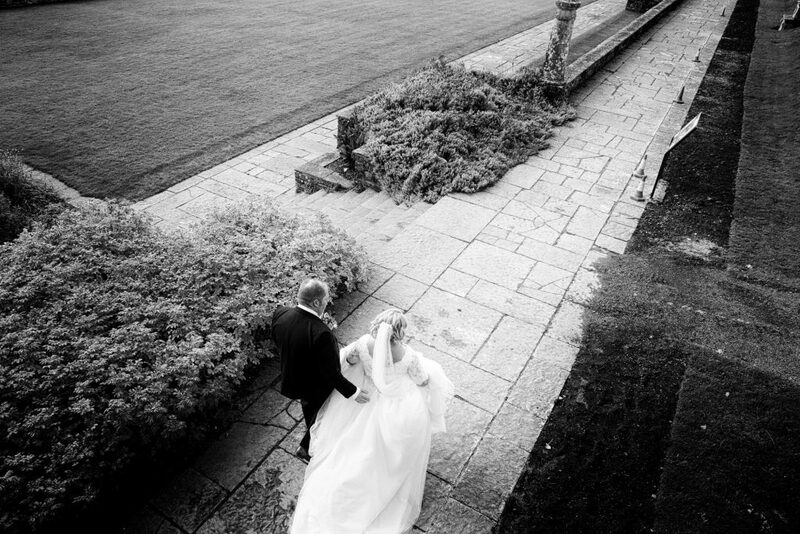 Our first task was choosing a date and we both settled very quickly on early October. We checked with Fr. Harding to see if the church was free and then we set about looking for a venue for the reception. We had two principal considerations when deciding on the venue, the first was the quality of the food and the second was having enough accommodation for all of our guests to stay. Beds for heads was a consideration as many of the people coming to the wedding were travelling from afar. As soon as we visited Mount Wolseley and met Gill we felt like this would be where we would have our reception. As soon as we had the decision on the venue made and booked, we confirmed the church and then booked the band immediately. The time we put in to organising these 3 parts paid off in the long run. We took a few days just after Christmas and booked consultations with all the hotels in the region one after another – on one of the days I think we visited 5 hotels. Travelling to the various hotels gave us an insight into what was on offer and I think it was very important to follow through on this. I went to the Wedding Fair in City West just after Christmas also with my maid of honour, Catherine, and we got great ideas from that day. Catherine booked a Photobooth for us as a wedding present at the fair. I also found the invitation supplier that day and brought home lots of samples and myself and Francis then made our choices. The colour for the day was Francis’ choice – as it was the colour from the World Scouting Organisation – of which he is a member. Because of his affinity to scouts, his best man, Ollie, who has been in Scouts with Francis since childhood, organised for a Flag Parade outside the church after the ceremony. 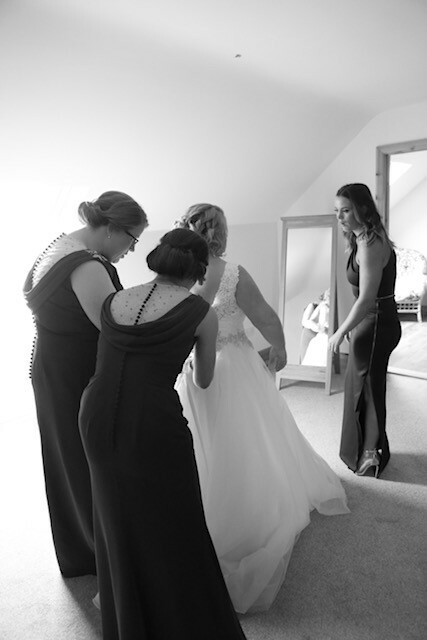 As we had the colour pinned down, it made choosing the bridesmaids dresses a lot easier, as we were more concerned about comfort and fit rather than trying to sort a colour as we had the Pantone code. For my own dress, I did a lot of research online before going to the bridal boutiques. I knew the shape and fit that I needed, and even though I tried on a number of different styles, the dress I settled on in the end was exactly what I had imagined from the beginning. I couldn’t find a suitable bolero to match my dress, so Maya O Brien, the seamstress who adjusted the length of my dress, was able to make a bolero for me. The lace on the bolero matched the lace on my dress and around the rim of my veil – so it was absolutely perfect. I think that we had the wedding dress and the bridesmaids dresses ordered and sorted by the beginning of March. Visiting the Wedding Fair gave me a good idea of the prices of the various “parts” of the day. We decided to forego the chauffeur driven wedding car and my brother drove me to the church with my dad in Francis’ car. After the ceremony Francis drove the two of us to the reception. This was one of the highlights of the day. We had time alone in the middle of the day to be together – we had such fun going back over the day so far and it gave us the opportunity to have some time by ourselves in the middle of the action. I would highly recommend this to anybody considering the transport on the day. Initially we had decided against a videographer for the day – however by the time June came around I was wondering if we should have booked one. Before broaching the subject with Francis, I carried out a bit of action research and a message was sent to all my girlfriends who were married asking if they were happy they had videoed their wedding and if they hadn’t, do they wish they had? The results were amazing – everyone who had one, was delighted with it, and everybody who didn’t have one wished they had!!! Francis agreed with the results and I contacted the photographers to see if they could recommend anybody. Keith and Evelyn had worked with Tadhy before and thankfully he was free on our day so we booked him. Between the 3 of them they did an amazing job on the entire day. Keith was able to go to Francis’ mother’s house where Francis and the boys were getting ready the morning of the wedding, Evelyn stayed in our house with me and the girls and Tadhy moved between the two to capture everything. I have to say, we were blessed – the professionalism displayed by the photographers and videographers was commendable and they fitted seamlessly into the day. We stopped for our “outdoor photos” in Haywood Gardens which was along the route to the reception. We had such fun as a group and even when we had to concentrate on the photos, there was never a moment of being ultra-posed of seriously formal – it was all just easy and fun. We were on a tight schedule because of the journey between Roscrea and Tullow and wanting to get the most out of the reception, so we only had about 30mins on the photo stop, but the results were phenomenal. At the end of the day Tadhy sent us a 2 minute preview of the video he had taken and as we watched it we were absolutely delighted we had decided to go with his company. At the end of the wedding day to have this gift of look back was just the best thing ever. Of course, it made the wait for the complete film torturous as we were so excited to see everything. YES!!!! Both were the cookie cutter versions of what any girl would want. Not alone were the groom and maid of honour hands on, but the best man, groomsmen and bridesmaids were the best I could have wished for. Every single one of them played an integral role in the running of the day and I didn’t have to move sideways to get something as it was already in front of me as soon as I thought of it. All the different parts of the day fitted seemlessly together because of the people involved – the bridal party, my parents, Francis’ mom, all our friends and relations – everybody was just wonderful. There was a funny point during the ceremony where it came to signing the register. 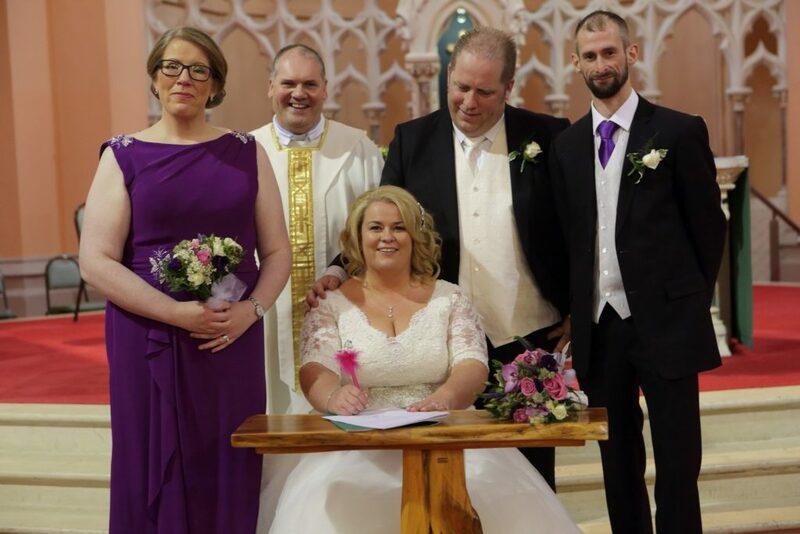 I had previously joked that I would like to sign it with a pink, fluffy, unicorn pen and as they were preparing the table to sign the papers, James, one of the grooms men produced the pink, fluffy, unicorn pen. It sums up what I mean about the attention they all paid in the run up to the day and then during the day they remembered all the important bits and pieces. Not that I am aware of because it was all taken care of by the bridal party. There are millions, but travelling together on our own from the ceremony to the reception allowed us the time to go back over all the moments. That is a difficult question – there is nothing I would change about the day, or that I got flustered about in the run up to the day. I did talk to my friends about the best parts of their days and my colleague at work was getting married 4 weeks after me so we were able to compare and contrast a lot on where we were in our planning and what she had done and what I had done. Lots of people gave different pieces of advice, and while I listened to everybody, I did figure out with Francis exactly what was important to us on the day and we went with that. One of my friends told me to be sure to walk slowly up the aisle and look around. I am so glad I knew this and it was the best advice I had received. It gave me the time to take everything in and to see the familiar faces in the crowd and any nervousness that I was feeling about the crowd immediately disappeared because I knew I was in the middle of “my own” people. Oh and my own bit of advice – have multiple pairs of shoes! I think I changed my shoes about 3 or 4 times during the day. I wouldn’t change a single second of the day. For the ceremony we had the Munster Rugby Supporters Choir sing for us. It was one of the highlights of the day. We had an amazing time working with the choir choosing the songs for the day and we managed a really good mix of songs. We incorporated “The World in Union”, “Canon Lan”, “There is an Isle” and a few more typical songs from the Rugby Matches. We went to the Autumn Internationals when we returned from honeymoon and when the Garda Band played the “World in Union” before one of the matches I was taken right back to the day of the wedding and it was absolutely amazing. Every time we hear these songs now it is a reminder of our own day and it is like a little present every time. We put a lot of time and thought into the ceremony and it is paying dividends now and will continue to do so every time we hear our songs. Another important part when we were deciding on the elements of the ceremony was to include Francis’ father who had passed away 5 years ago. Both Francis’ father and my dad are carpenters. Francis’ dad had made some fabulous bowls and candle holders and we had one of these in our house. My dad was able to take the candle holder and replicate it. We used these to hold the wedding candles and it was our own nod to including both fathers in the fabric of the ceremony. Niamh and Fergal Hobbs, from O Donnell Hobbs Jewellers in Roscrea were absolutely amazing in relation to the rings and jewellery for the day. Niamh helped Francis with the engagement ring – which fitted perfectly, and then finding the matching wedding ring was a walk in the park with Niamh’s help. They allowed me to take away multiple pieces of jewellery when I was going for my dress fittings so that I would be able to make a good decision on the other bits and pieces I needed for the day. This made the decision making process so much easier. The day after the wedding we went to Fiacri House in Roscrea. We had the entire place to ourselves and had a fabulous barbecue and a night filled with singing and dancing. Marion Murphy Cooney from the Design Atelier in Nenagh made my outfit for the second day of celebrations. 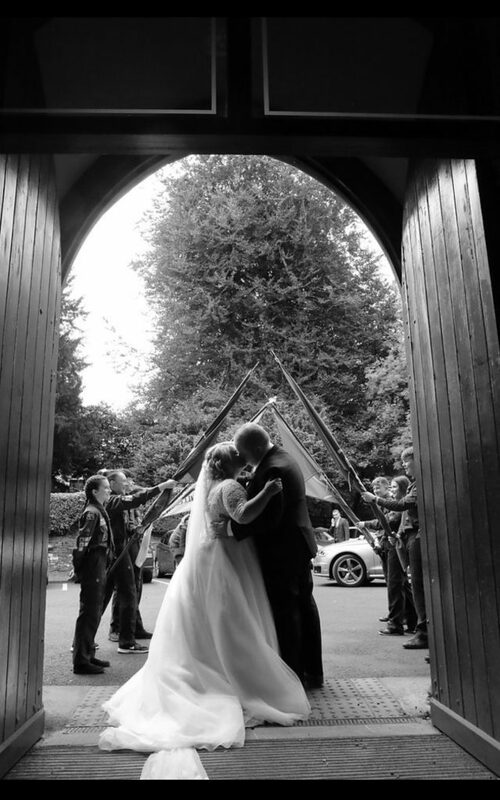 The wedding co-ordinatior in Mount Wolesley hotel, Gill Long, was phenomenal throughout the entire process. We went to St. Lucia and New York on our honeymoon. Romy with Tropical Skies was really excellent in helping us to decide on where to go as we toyed with everything from Australia to a Safari in Africa. The two centre honeymoon was ideal as it gave us the opportunity to have a rest in St. Lucia and then be ready again for the sights and sounds of New York. We went on our honeymoon the Tuesday after the wedding and we are delighted that we decided to go so soon after and it meant that we were still on the wedding high and everything was all exciting and it was great to be able to get away together while still in the bubble of such a wonderful wedding. 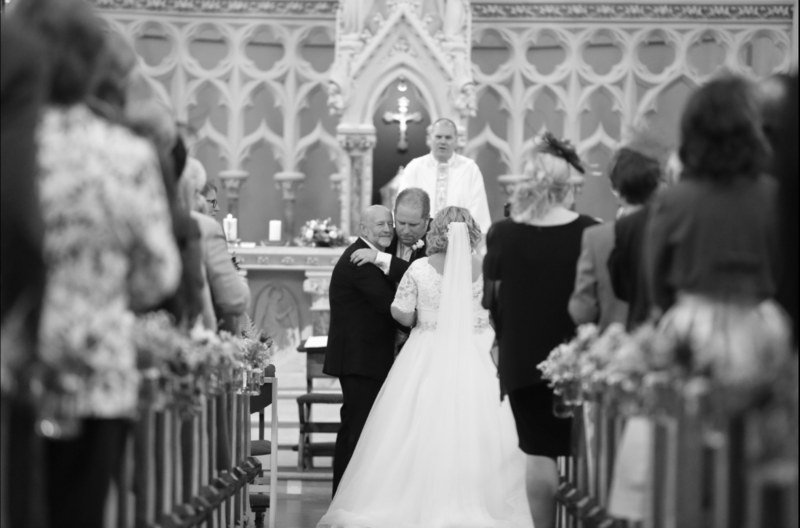 Thank you to Elaine and Francis for sharing their wedding day. Take a look at a video snapshot of their day here to see more. ← How to create your own Wedding or Hen Party Snapchat filter!